Sometimes Christian communities seem to say one thing and do another. The European and American missionaries who traveled to Southern Africa in the nineteenth century were a striking example of this. While they (often) spoke powerfully of equality, they (often) set up practices and institutions that normalized the opposite. How did this happen? Some scholars have emphasized the missionaries' Western ways of acting and thinking, which steadily entangled Africans who interacted with them in the Western colonial net. Others have pointed to the importance of the missionaries' limited historical perspective and agency. However, the discussion has mostly ignored or downplayed the contribution of the missionaries' Christianity to this puzzle. In Mission Station Christianity I employ the lens of the anthropology of Christianity, suggesting that the particular Christianity that crystallized on the mission stations contributed decisively to the missionaries' becoming cheerleaders of Empire. led by Norwegian (or other white) pastors instead of Zulu pastors. Mission Station Christianity presents an anthropological history of the ideas and practices that evolved among this group as they sought to "make God present." I examine how the missionaries' daily Christianity influenced how they set up the mission stations, and how, in return, these spaces came to influence the missionaries' daily Christianity. Words and objects, missionary bodies, problematic converts, and the utopian imagination are discussed, as well as how the Zulus made use of (and ignored) the stations. Methodologically, I trace this process based on "ethnography in the archives": drawing on an ethnographic perspective while reading closely and interpreting old missionary sources, such as letters and reports. 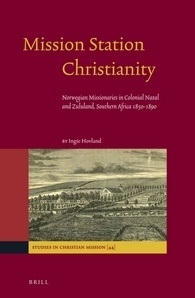 The majority of the Norwegian missionaries had become practical and theological supporters of British colonialism by the 1880s, and I argue that this situation was prepared and made thinkable by their spaces - the everyday patterns of Christianity they had set up and become familiar with on the mission stations since the 1850s. In sum, an important reason for the contradictory effects that the Christian missionaries produced in South Africa's history was their Christianity: "their way of working out how to live Christianity in the world and to create an inhabitable Christian space" (p. 233). "Umphumulo is the most beautiful place I know. Not because of any particular splendor, though the warm, hard-packed red earth, the hundreds of shades of encapsulating green, and the tall blue sky do something to your senses. I lived at Umphumulo in the late 1980s..."